By Daniel Aloi |link to original article on Cornell news. 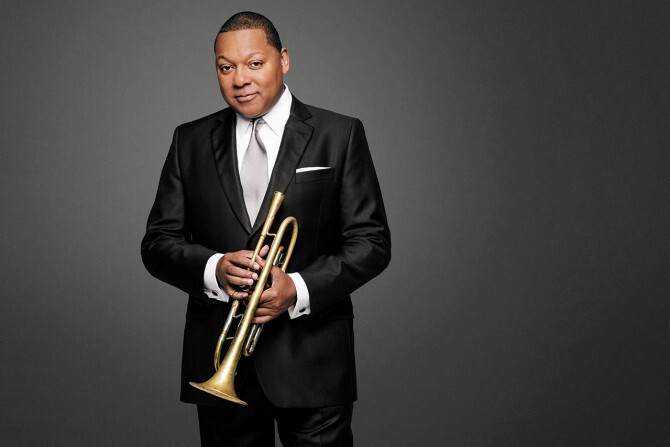 Wynton Marsalis will visit Cornell starting March 22. Famed musician Wynton Marsalis comes to Cornell next week for his first visit as an Andrew Dickson White Professor-at-Large, to mentor and perform with student musicians, participate in classes and engage with the campus and Ithaca communities. His visit March 22-28 includes a free public concert, with Marsalis performing with the Cornell Jazz Band and Wind Symphony, Wednesday, March 28, at 8 p.m. in Bailey Hall. The concert also features a new orchestration of Marsalis’ “Blues Symphony” performed by the Cornell Symphony Orchestra. No tickets are required; the event is first-come, first-seated. A Grammy and Pulitzer Prize-winning trumpeter, bandleader, educator and composer, Marsalis is artistic director and co-founder of Jazz at Lincoln Center in New York City, a performance space and a center for advocacy and educational programs in jazz. “As a trumpet player, I am beyond excited and honored to have the opportunity to work with Wynton Marsalis, who has been a big influence for me since very early on,” said computer science major Tharun Sankar ’20. Marsalis’ itinerary reflects his broad expertise and educational interests. In addition to addressing music classes (Steve Pond’s A Survey of Jazz, James Spinazzola’s Introduction to Western Music Theory, Rebecca Harris-Warrick’s Classical Music from 1750 to the Present, and Merrill’s Jazz Theory and Improvisation class, where he will talk about the blues), he will speak to American studies students of Margaret Washington (Black Spirituality, Religion and Protest) and Penny Von Eschen (U.S. in the World) and to Kevin Gaines’ Intro to Africa and its Diaspora students at the Africana Center. He’ll also discuss jazz composition and history with doctoral students, give a master class at Ithaca High School and engage with local middle school students, parents and community members at Beverly J. Martin Elementary School. The Cornell and Ithaca High School classes are for enrolled students only and closed to the public. Marsalis will lead a master class for Cornell students who are performing March 25 in Barnes Hall Auditorium. Colin Hancock ’19 and The Original Cornell Syncopators will play early jazz from Harlem and the Cornell Jazz Band performs music by 1930s jazz groups from Ellington to Jimmy Lunceford and Chick Webb. The 8 p.m. concert is open to the public. “There has been a lot of interest among our students to rediscover earlier forms of jazz. A lot of this movement was started by Colin Hancock, and it’s caught on with the whole jazz program,” Merrill said. The concert program March 28 also includes music by Ellington (“Tourist Point of View” from “Far East Suite”), a jazz arrangement of Leonard Bernstein’s “West Side Story” and the first movement of “A Love Supreme” by John Coltrane. Since September, the symphony orchestra has included jazz works in each of its concerts. Marsalis was elected in 2015 as an A.D. White Professor-at-Large at Cornell for a six-year term, July 2015 through June 2021. He last performed in Ithaca in 2010 with the Jazz at Lincoln Center Orchestra, in Bailey Hall and at Ithaca High School. He played at a gala celebration of Cornell’s sesquicentennial in New York City in 2014.